Santa Fe, N.M. (July 14, 2011) - New Mexico Gov. Susana Martinez is offering a reward of $10,000 for the "capture" of William H. Bonney, a.k.a. "Billy the Kid", and called for citizens to travel the state of New Mexico to find him. Starting today through September 2011, families can track down this iconic U.S. outlaw and claim the reward as part of the New Mexico Tourism Department&apos;s "Catch the Kid" summer travel promotion. Families in honorary sheriff "posses" will have access to exclusive New Mexico travel deals and weekly vacation giveaways throughout the summer. To participate, families should register online at www.CatchTheKid.com. "Billy the Kid remains one of New Mexico&apos;s most iconic and infamous characters," said Monique Jacobson, New Mexico Tourism Cabinet Secretary. "We are offering a $10,000 reward for his capture, which is equivalent, with inflation, to the $500 reward offered by Governor Lew Wallace in 1881." "I encourage everyone to take this opportunity to visit the Land of Enchantment throughout the next 10 weeks for a chance to &apos;Catch the Kid&apos; and to take advantage of amazing deals, discounts and one-of-a-kind giveaways that only New Mexico can offer." 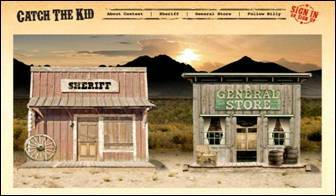 To participate, people can log onto www.CatchTheKid.com to create a posse profile. If they have a Smartphone they can download the "Catch the Kid" Smartphone app. If not, they can play along by taking pictures next to clue posters located throughout the state and upload them to their profile page. Designated locations around New Mexico will unlock clues that lead to Billy&apos;s New Mexico hideout. The more clues they collect, the more information they will have about where, when and how to capture "the Kid". The first posse to present "The Kid" with an arrest warrant will win the $10,000 reward. Players can unlock additional New Mexico travel deals and win prizes along the journey if they use the Smartphone app developed specifically for this game. The app allows players to find Billy&apos;s loot which is virtually placed and hidden all over New Mexico in every county. Players can collect his money bag loot and use it to buy vacations, deals or even meals online in the general store section of the "Catch the Kid" website. "The coolest thing about this promotion is that we are turning the whole state into a real life video game. People can collect loot, get clues and win prizes and deals just by traveling to see all the amazing treasures New Mexico has to offer. Where else this summer can you experience all of that while taking your family on a trip they&apos;ll never forget?" Secretary Jacobson said. For a list of travel deals, discounts and vacations that can be purchased with Billy&apos;s loot, log on to www.CatchTheKid.com. Footage of the Governor&apos;s announcement, giveaway details, and screen grabs of the promotion&apos;s website and Smartphone app, as well as high-resolution images of Billy-the-Kid-related locations throughout New Mexico, are available upon request. For more information on New Mexico Tourism Department&apos;s "Catch the Kid" promotion, visit www.CatchTheKid.com.